I'm enjoying the extra time I've got now that my two boys are out of college and living in Brooklyn. (Although...there's not as much free time as I thought there would be. Why is that?) Still, I do have a little more time for exploring new things and finding solutions to old problems. This week, when I pulled out my little suede booties, I noticed they were looking tired and dusty. Gulp. I admit it: Treating or cleaning suede terrifies me. My policy with suede has always been to avoid inclement weather and hope for the best. This week, however, I found a little extra time and decided to research suede care on the Internet and interview my favorite cobbler. Click "Read More" for tips I compiled on how to clean suede boots. Clearly, how much you need to do to your suede boots will depend what kind of shape they’re in. Here are some tips to help with a variety of suede woes. Press a towel against the outer surface of the boots to absorb as much moisture as possible. Stuff the boots with newspaper or rags and allow them to dry overnight. Do not use a hair dryer or space heater to dry your boots. Remove dust and/or dirt by brushing shoes with a suede brush or clean soft toothbrush. Brush the suede in one direction to restore the natural nap. Steve Madden’s website suggested using a nail file in lieu of a suede brush or toothbrush. Rub a new pencil eraser or suede cleaning block over the non-oil based stain. Gently sand any stubborn stains with a nail file or emery board. If you try using a pencil eraser for cleaning suede boots and that doesn’t work, you can always purchase an eraser designed especially for cleaning suede boots. These are usually available at shoe repair shops. Brush the suede. Make a solution of Dawn dish soap with warm water. Dip a clean soft toothbrush in the solution’s suds (Only use suds and don’t saturate the shoe!) and gently rub back and forth on suede. When the shoes are dry, brush against the suede with a dry soft toothbrush to restore the nap. If the stain is oil-based, you might try covering the spot with baby powder. Let the powder stand for a minute, and then brush it off. You may have to repeat this a few times. Several websites recommended a 50/50 white vinegar-water solution to clean salt stains on suede. Has anyone tried this? Unless my boots were near their end, I don’t think I could knowingly put vinegar on them. But apparently, others do. This scaredy cat would rather pay for a professional cleaning. Apply a suede waterproofing compound especially designed for suede. Follow the label's direction. If, like me, spraying suede with chemicals makes you nervous, consult a trusted shoe cobbler. Though, my shoe specialist felt one product was superior to another, he steered me away from the "better product" when I told him my boots were a medium brown. Apparently, the superior product might turn my boots a dark brown hue. When I asked my cobbler how often I should waterproof my boots, he said, “It all depends on how often the boots are worn and their exposure to the elements (ie, rain, snow, mud, salt, etc.). As with any fabric, test a small, unseen patch first. I brushed and waterproofed my boots (above). Those two simple steps perked them up a bit--though it doesn't really come across in a photo. Store suede items so that they can breathe. Avoid plastic bags, which prevent air circulation. Instead, use a flannel bag or pillowcase to keep shoes dust-free. When traveling, don't use a plastic bag. Again, a flannel bag or pillowcase is the way to go. 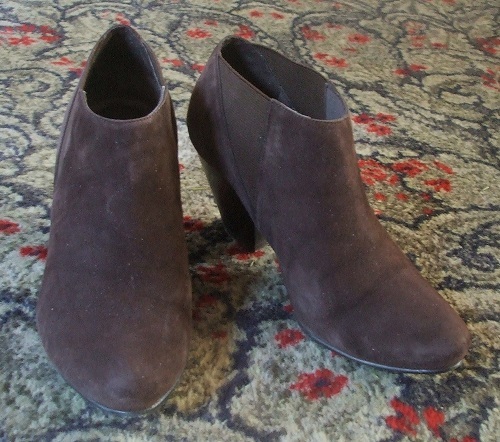 Keep suede boots away from the light, which can fade the color. Keep away from damp conditions, which promote the growth of mold and mildew. Don't use hot water on your suede boots. Hot water can cause shrinkage, fading, and maybe even ruin the boot's shape. I got a suede brush and waterproofing product from my favorite shoe cobbler. If you don’t have a nearby shoe repair shop, you’ll find the products all over the Internet. I found a couple of programs on Zappos. Got a really bad stain? Or, are you uncomfortable with DIY suede cleaning? Most sites highly recommend you seek professional care from a shop specializing in leather and suede. Across the web, sites stressed to be weary of inexperienced dry cleaners, who may do more harm than good.